Approximately two-third of the refracting power of the eye is supplied at the air/tear interface that lies on the front surface of the cornea which is generally referred to as the anterior refracting surface of the eye. The cornea makes major part of refraction of the eye. The refractive power of the anterior corneal curvature can be measured by an instrument known as keratometer and the procedure is known as keratometry. This refractive power is expressed in diopters (D). Various keratometers are commercially available for clinical use. Manual (Bausch and Lomb [B&L] and Javal–Schiotz), automated (autokeratorefractors, IOL Master) keratometers, and devices for simulated keratometry (corneal topographers) are the most common instruments used for this purpose. The B&L manual keratometer (MK) has remained essentially unchanged since 1932 and is most commonly used. It helps in measuring the curvature of the central 3 mm (mm) of the cornea with readings ranging from 36 D to 52 D.
Automated keratometers have gained widespread acceptance in the field of eye care since its inception in early 1980's. Most units of automated keratometer measure corneal curvature by projecting three beams of near-infrared light with light-emitting diode as a source in a triangular pattern onto a central corneal area of about 3–3.3 mm in diameter. The readings range between 33.75 D and 67.50 D.
MK has been used for years for the measurement of corneal curvature in adults. It requires patient's cooperation and many children are very uncooperative for this procedure. In these young uncooperative children, keratometry needs to be done while the child is sleeping, under oral sedation or general anesthesia with the help of portable automated keratometer (PAK). There are very few studies which have compared automated keratometer with MK in children. Keeping this in mind, the present study was undertaken to compare keratometry measurements by MK and PAK in pediatric age group. This observational cross-sectional study was approved by the institutional research ethical committee and was in accordance to the tenets set forth in Declaration of Helsinki. This study was conducted over 12 months from March 2015 to March 2016. A total of 404 eyes of 202 children aged between 5 and 16 years who presented for refraction and whose parents/guardians gave consent for examination were included in the study. Eyes with known congenital ocular abnormalities such as nystagmus, cataract, conjunctival or corneal pathology, irregular astigmatism, systemic ailments, and keratometry readings <36 D or more than 52 D were excluded from the study. Participants with a history of intraocular or extraocular surgery, contact lens usage, head tremors, and participants unable to cooperate for the procedure were also excluded from this study. Both the instruments MK and PAK were calibrated before the study using standard protocol. For recording measurement of the right eye, R button was pressed and the power was ON automatically. The patient was asked to watch the fixation light (red light) inside the measuring window. While looking into the observation window, the main body was moved until the size of target ring almost coincided with the outer circles of iris and the target ring became a concentric circle with the mire ring. When measuring window was brought around the focusing point (about 40 mm in front of patient's eye), the target ring started to blink and the blinking speed became higher as the focusing point got closer. When it was exactly focused, a beep sounded and the target ring disappeared to notify that the measurement was completed. The values displayed on the screen were noted, horizontal and vertical meridia were decided on the basis of the value of the axis; 180° axis was converted to 0 as per convention. For the left eye, L button was pressed and above said steps were repeated. After one set of reading, the patient was asked to close eyes for 5 min to restore stable tear film and to relax the child. The PAK measurements were taken always by holding it in a vertical position. Three set of readings were taken for each eye using MK and PAK by a single observer. The mean of three keratometry readings was calculated. Keratometric astigmatism (KA) was calculated as the difference between the steeper and the flatter meridian. The mean of KA was also calculated. Data were expressed in term of mean ± standard deviation (SD). All statistical interpretation and analysis of results obtained were carried out using statistical software SPSS version 22 (Statistical Package for Social Sciences, version 22, SPSS Inc, Chicago, IL, USA) and Microsoft Excel. Continuous variables were presented as mean ± SD. Categorical variables were presented as absolute numbers and percentages. The comparison of normally distributed continuous variables between the groups was performed using paired Student's t-test. Nominal categorical data between the groups were compared using Chi- square test or Fisher's exact test as appropriate. Cronbach's alpha test was used to calculate the intraclass coefficient for repeatability. The P < 0.05 was considered statistically significant. A total of 404 eyes of 202 patients were studied which included 116 (57.44%) males and 86 (42.56%) females (P = 0.349). The mean age of the children included was 10.94 ± 3.04 years [Table 1]. In males, the mean of average vertical and horizontal meridia readings was 43.08 ± 1.45 D and 42.67 ± 1.47 D, respectively. In females, the mean of average vertical and horizontal meridia readings were 43.46 ± 1.59 D and 43.13 ± 1.43 D, respectively [Figure 1]. On comparing the mean of average KA, MK and PAK were 0.661 ± 0.796 and 0.633 ± 0.590, respectively, the difference between the two instruments was not statistically significant (P = 0.573). The correlation coefficients for KA measurements obtained using MK and PAK in 1st, 2nd, and 3rd set of readings were 0.907, 0.951, and 0.949, respectively [Table 3]. The mean of axis measurements obtained using MK was 10.33 ± 36.47° and using PAK was 20.78 ± 12.39°. On comparing these values, there was statistically significant difference between the two instruments (P = 0.01) [Table 4]. The intraclass correlation for vertical meridia, horizontal meridia, and axis measurements using MK were 0.888, 0.993, and 0.973, respectively, the mean of SD within sessions were 0.05, 0, and 0.868, respectively. The intraclass correlation for vertical meridia, horizontal meridia, and axis measurements using PAK were 0.994, 0.989, and 0.963, respectively, the mean of SD within sessions were 0, 0.03 and 1.350, respectively [Table 5]. The PAK is handheld instrument designed to provide rapid and precise estimate of keratometry in adults. Although there have been few published reports, in which PAK was used for young children. The portability and ease of use of PAK suggest its utility in screening of young children. The MK has been the gold standard keratometer since years. In the present study, both the meridia were slightly steeper in females than males by a difference of <0.5 D, but this difference was statistically nonsignificant as P value for vertical meridia and horizontal meridia were P = 0.287, 0.325, respectively. Similarly, Iyamu and Osuobeni concluded that females had slightly higher mean of average corneal curvature measurements; however, there was no statistically significant difference. Lam reported the difference of more than 0.5 D when the instrument was held at the orientation of 15° or more as compared to the vertical plane, and they also concluded that the PAK should be used in a vertical position to obtain accurate measurements which was applied in the present study also. They also suggested that the tendency for females to have steeper meridia may be linked to the fact that females have shorter axial length than males. In the present study, on comparing MK and PAK using three criteria which were mean of the two keratometric readings, correlation between the keratometric readings and mean KA, the results showed no statistically significant difference. These results were in concordance with Jarvis et al. 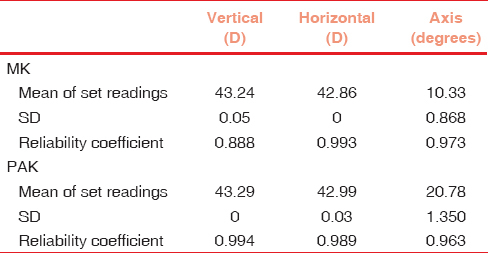 who compared the accuracy of PAK with MK on the basis of mean difference of astigmatism between the two meridia which was 0.0189 ± 0.5878 D and average keratometry reading was 0.0318 ± 0.5878 D with no statistically significant difference (P > 0.001). Ale Magar reported mean difference between MK and automated keratometric readings was not statistically significant which was same as reported in the present study. Hammack in their study reported correlation coefficient of 0.97 on the linear regression analysis of the individually automated keratometer compared with MK keratometry readings which was comparable to the various coefficient values obtained in the present study. Similar findings were reported by Ramakrishnan and Naik and Elliot et al. Sunderraj reported statistically significant difference of 11° in the measurement of the axis by automated keratometer in comparison to MK (P< 0.001) which holds true for the present study also where difference was about 10.45°. Halberg et al. also reported statistically significant difference between MK and automated keratometer in axis measurement. The intratest reliability test in this study indicated good repeatability of MK and PAK for vertical, horizontal meridia and axis measurements which were 0.888, 0.993, 0.973, and 0.994, 0.989, and 0.963, respectively. Jarvis et al. also reported the intraclass correlation for average MK and PAK keratometry reading as 0.981 and 0.995, respectively, which was similar to the present study results. Similarly, Chang et al. reported good reliability of the mean keratometry reading by automated keratometer. Similar findings were reported by Iyamu and Osuobeni and Noonan et al. The study had following limitations: (1) the study only included children with age >5 years and (2) children with various ocular pathologies were not included as well. Keratometry measurements using MK and PAK showed good reliability using intraclass correlation for horizontal and vertical meridia. Both the instruments (MK and PAK) provided significantly similar keratometric readings for horizontal and vertical meridia. However, the study shows that the axis measurements obtained using both the instruments were not interchangeable. Hence, automated keratometer offers precision in measuring the keratometric values for various purposes such as IOL calculation and contact lens fitting in children where MK is not possible. Horner DG, Salmon TO, Soni PS. Corneal topography. In: Benjamin WJ, editor. Borish's Clinical Refraction. 2nd ed. Philadelphia: W.B. Saunders; 2006. p. 645-81. Ledford JK, Sanders VN. The Slit Lamp Primer. Thorofare: Slack Incorporated; 2006. Tejedor J, Guirao A. Diagnosis and Imaging of Corneal Astigmatism. Spain: INTECH Open Access Publisher; 2012. Gutmark R, Guyton DL. Origins of the keratometer and its evolving role in ophthalmology. Surv Ophthalmol 2010;55:481-97. Edwards K, Sherman J, Portello JK, Rosenfield M. Examination of the anterior segment of the eye. In: Rosenfield M, editor. Optometry: Science, Techniques and Clinical Management. UK: Elsevier Health Sciences; 2009. p. 257-76. Ohashi Y. Nidek Auto Keratometer Model: KM-500 Operator's Manual. Japan: Nidek Co. Ltd.; 2004. Reichert. Riechert Keratometer Model: MK 1 User's Guide. Germany: Riechert Inc.; 2010. Cordero I. Verifying the calibration of a manual one-position keratometer. Community Eye Health 2013;26:77. Lam AK. A hand-held keratometer. Ophthalmic Physiol Opt 1995;15:227-30. Iyamu E, Osuobeni E. Age, gender, corneal diameter, corneal curvature and central corneal thickness in Nigerians with normal intra ocular pressure. J Optom 2012;5:87-97. Jarvis VN, Levine R, Asbell PA. Manual vs. automated keratometry: A comparison. Eye Contact Lens 1987;13:235-7. Ale Magar JB. Comparison of the corneal curvatures obtained from three different keratometers. Nepal J Ophthalmol 2013;5:9-15. Hammack GG. Evaluation of the Alcon Renaissance handheld automated keratometer. Int Contact Lens Clin 1997;24:59-65. Ramakrishnan R, Naik A. Comparison of manual keratometer with autokeratometer. Biosci Biotechnol Res Asia 2014;11:339-41. Elliott M, Simpson T, Richter D, Fonn D. Repeatability and comparability of automated keratometry: The Nikon NRK-8000, the Nidek KM-800 and the Bausch and Lomb keratometer. Ophthalmic Physiol Opt 1998;18:285-93. Sunderraj P. Clinical comparison of automated and manual keratometry in pre-operative ocular biometry. Eye (Lond) 1992;6(Pt 1):60-2. Halberg GP, Almeda EE, Sanfilippo DM, Halberg ME. A new auto keratometer. Eye Contact Lens 1982;8:173-80. Chang M, Kang SY, Kim HM. Which keratometer is most reliable for correcting astigmatism with toric intraocular lenses? Korean J Ophthalmol 2012;26:10-4. Iyamu E, Amiebenomo OM, Benin BC. Assessment of the Accuracy and Reliability of Handheld FKE-03 Autokeratometer. Available from: http://www.hindawi.com.www.downloads.hindawi.com/journals/joph/aip/709158. [Last accessed on 2014 Oct 09]. Noonan CP, Mackenzie J, Chandna A. Repeatability of the hand-held Nidek auto-keratometer in children. J AAPOS 1998;2:186-7.